Compare prices on car hire in Glasgow Airport from all the major brands and find the best deals. When you book through us, unlimited mileage and insurance are always included in the price given. Glasgow International Airport (GLA) is located 11 km west of Glasgow .It is the second largest airport in Scotland .There are regular buses between the airport and Glasgow, and a railway station is 3 km from the airport. The companies that offer car rental Avis, Enterprise, Europcar, Hertz, National and Alamo. In 2009, 7,255,000 passengers used the Airport. Glasgow Airport is the main base for Loganair and EasyJet. In 2008, the five most popular international destinations Amsterdam , Tenerife , Palma, Alicante and Dubai .Glasgow also has another airport that primarily serves low cost companies, Glasgow Prestwick Airport. Glasgow Airport has a good selection of shops with duty free, cafes, bars and restaurants. Amenities include wireless Internet, opportunities for massage, cash, children’s play room, pharmacy and business center. 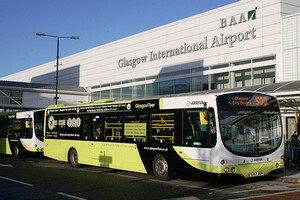 There are 3 different hotels at the airport, it’s Holiday Inn Glasgow Airport, Express by Holiday Inn and Holiday Inn.